Business. Healthcare. Where they meet is you. 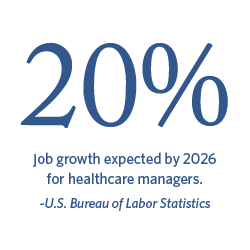 Our robust healthcare management degree will prepare you for executive-level positions in this hot job market. With this on-campus or online Master of Business Administration (MBA) – Healthcare Management degree, you'll explore topics like decision-making, marketing and finance as they apply to the healthcare field. Master the industry-specific knowledge and tools essential to work for hospitals, health systems, physician practices, and government agencies. Create competitive processes and strategies for the rapid pace of change in healthcare, including the complexities of healthcare law. Explore entrepreneurial technologies and their associated progressive medical procedures. Taught from Christian perspective, our Master of Business Administration is ranked one of the best online MBA programs in Virginia. ACBSP accredited. Skillfully manage the day-to-day intricacies of healthcare systems. Make critical financial decisions using key skills like budgeting and forecasting. Understand healthcare policy development, ethics and legal issues including forensic medicine, medical malpractice and medical proof in litigation. Jumpstart your career. A recently graduated student looking to get their career started – These students will conduct research in their areas of interest, complete projects in the traditional business competencies covered in the program (but from a holistic perspective), and gain all this knowledge while building a portfolio they can bring to a job interview to showcase the tangible outcomes of which they are capable. Support for an entrepreneur. Simply put, many Regent students build their company through the MBA degree program. Each course lays another foundational block in the key areas of business, while students construct a business plan throughout the program. Many will utilize the last core course in the program to launch their initiative.